"I have again and again been faced with the mystery of love... To speak of partial aspects is too much or too little, for only the whole is meaningful." 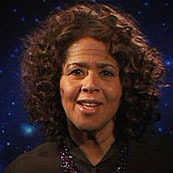 Hosted by author, playwright and actress Anna Deavere Smith, "The Mystery of Love" is a two-hour PBS documentary that puts love on the public agenda. In popular culture, one type of love — sexual romance — is prized above all. But there are many kinds of love that give shape and meaning to life, passionate connections that define what we value and who we are. Despite thousands of years of advice from philosophers and sages and libraries filled with answers, love remains as one of the immense on-going mysteries of life. "The Mystery of Love" is the first in a series of three films being funded by the Fetzer Institute as part of its Campaign for Love & Forgiveness, an inclusive, non-partisan initiative that explores how love and forgiveness can effect meaningful change in individuals and communities alike. Fall 2006 – "The Mystery of Love" was on the PBS NPS, but its airdate fell during a time (December 13th) when many stations would be pledging and therefore was in danger of being pre-empted for pledge specials. Kristin was brought on as PBS station liaison and program advocate with the goal of securing as many scheduled broadcasts as possible, and beyond that, optimum alternative broadcast dates during the month of December, especially around the holidays. By the time of its premiere, "The Mystery of Love" had 337 confirmed December broadcasts in more than 97% of the country, making the special available to well over one hundred million television households. 86% of the top 100 markets aired "The Mystery of Love" in primetime. "Thanks again for your help and your powers of persuasion. You're better than a sheepdog in New Zealand rounding up this flock (of PBS stations.)" Executive Producer & Writer, "The Mystery of Love"
"Kristin, we really enjoy working with you and appreciate your frequent and full communications with us." "The Mystery of Love" convinces us that there are a lot of love stories around us all the time. All we need to do to see them is to broaden our understanding of this essential spiritual practice. We encourage you to tune in to this special on PBS. Let this television event be the start of your exploration of love's many faces." Joan Konner is Professor and Dean Emerita of the Columbia University Graduate School of Journalism, where she served from 1988 to 1997 and as publisher of the Columbia Journalism Review from 1988 to 1999. Before going to Columbia, Konner worked in both public and commercial television for 26 years. During that time she produced and wrote more than 50 documentaries and served as executive producer of several major public affairs series. Her work has been honored by almost every major award for broadcast journalism, including 16 Emmys, the George Foster Peabody Award and the Alfred I. DuPont-Columbia Award for her producing and writing. Konner was Co-executive Producer ofJoseph Campbell and the Power of Myth with Bill Moyers for PBS. She also founded Public Affairs Television in partnership with Bill Moyers, and served as President of the company and Executive Producer of such series as God and Politics, In Search of the Constitution, and The World of Ideas. Alvin H Perlmutter, Director of the Independent Production Fund, has produced highly acclaimed information programming for over 30 years. Perlmutter’s television programs have aired on PBS, the commercial networks and cable in this country and have also been broadcast throughout Europe and the Far East. Prior to forming his own company, Perlmutter served as NBC News Vice President where he was responsible for all network documentaries and news magazine programs and earlier as Director of Public Affairs Programming and Program Manager of WNBC-TV, New York. He has been the recipient of every major broadcasting award including six national prime-time Emmys, the Peabody Award and five Ace Awards for excellence in programming on cable television. He was Executive Producer of the highly innovative public affairs magazine series, The Great American Dream Machine (PBS), and he was also the Co-executive Producer of Joseph Campbell and the Power of Myth with Bill Moyers (PBS). His more recent productions were Muslims, a two-hour Frontline special and God and Government, also for PBS.